Couples Negril in Jamaica, located on the north end of Negril Beach in Bloody Bay, is one of my favorite all-inclusive, couples only resorts. While some people are not comfortable at an all-inclusive resort, feeling they may become bored, there is plenty here to keep you busy. It is simply not possible to be bored at Couples Negril! There are plenty of fun things to do here to pass the time. And the best thing about them is that all of these activities are included in the price! For land sports, you can play tennis on four courts, join a game of volleyball, play a game of table tennis, and even take a dance class. If water sports are more your style, windsurfing, Hobie cat sailing, sunfish sailing, snorkeling, water-skiing, canoeing, catamaran rides, and glass bottom boat rides are all available. Prefer to stay indoors? Couples Negril offers a game room complete with backgammon, cards, dominoes, board games, and billiards. And if this isnâ€™t enough for you, the resort offers an air-conditioned fitness center. It is fully equipped with free weights, treadmills, Cybex, LifeCycle and Stairmaster equipment. Plus, you can enjoy a variety of classes, such as spinning, aerobics, yoga, meditation and Pilates. 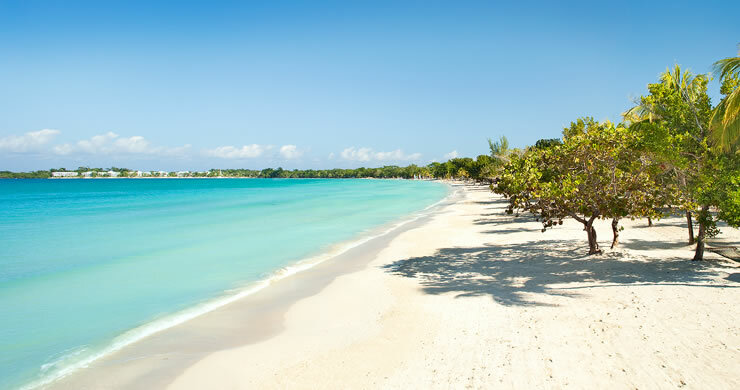 Couples Negril has a truly fantastic beach! The beach is white sand, and runs the length of the resort. The staff rakes it every day to cut down on the seaweed and other debris. At the far end of the beach is a â€œclothing optionalâ€� section, where you can sunbathe â€œau naturelâ€�. It is separated from the main beach with small hedges and trees. There are two pools. The main pool is absolutely huge, and flows into a smaller pool with a swim-up bar. There is also a dive pool where you can learn to Scuba dive. If youâ€™d rather just relax in a Jacuzzi, there are four to choose from. Two are adjacent to the main pool, so you wonâ€™t have to walk far to refill your drink at the bar! Ready to stay & play at Couples Negril? For additional photos, videos, information and prices for Couples Negril Resort of Jamaica, click here.